Spain's 'indignant' activists launched protest marches today which will culminate in a major Madrid rally on 24 July, showing no let-up just a day after rallying an estimated 200,000 protesters. Angry over the destruction of millions of jobs, welfare cuts and corruption, the first of at least three nationwide marches set off from eastern Spain's Mediterranean city of Valencia. Activists from Valencia will march and cycle on a 35-day, 500km route winding through 29 cities and villages in eastern Spain before arriving in Madrid. On the route they will hold meetings 'to bring the indignation to the interior of the Peninsula just as the movement is growing at the international level', said a statement by the group, Acampada Valencia. Other 'indignant' marches were scheduled to leave Cadiz in Spain's south on 23 June and Barcelona in the northeast on 25 June, all converging in the capital on the eve of the rally, organisers said. On Sunday, about 200,000 protesters packed the streets of Madrid, Barcelona and other major cities to vent their anger, according to estimates by the Spanish media and some regional authorities. In Madrid, an estimated 40,000 people converged from six points around the city to the central square of Plaza de Neptuno, near the Spanish parliament. 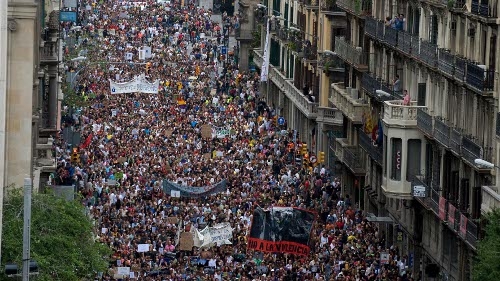 In Barcelona, another 50,000-75,000 demonstrators rallied, according to police and the city hall. Tens of thousands of others activists gathered in other regional capitals. Activists pointed their fury at the weekend against the 'Euro Pact' agreed in March by eurozone countries. Drawn up under pressure from France and Germany, the pact foresaw greater budgetary discipline and economic policy convergence to ensure that countries stabilise their finances and reduce debt. The protesters, who have won broad support in Spain, also targeted corruption-tainted politicians, poverty, their lack of voice in Spain's democracy, and a 21% unemployment rate. The protest movement started in Madrid on 15 May and fanned out nationwide as word spread by Twitter and Facebook, bringing tens of thousands of people into city squares around Spain ahead of 22 May local elections. 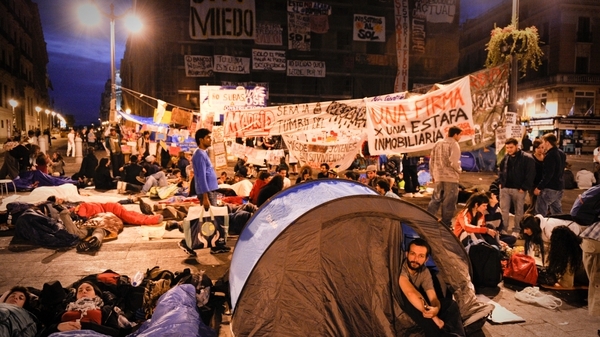 The protesters had set up a camp in Madrid's Puerta del Sol square, which was dismantled on 12 June although the group said that did not signal the end of their movement. The 'indignants' have inspired similar offshoot movements in other European countries, notably Greece, where the government is also trying to implement a strict austerity programme to avoid defaulting on its loans. The Spanish central bank said last week the recovery in Spain's beleaguered economy would likely remain slow, and that unemployment could remain high for the foreseeable future.